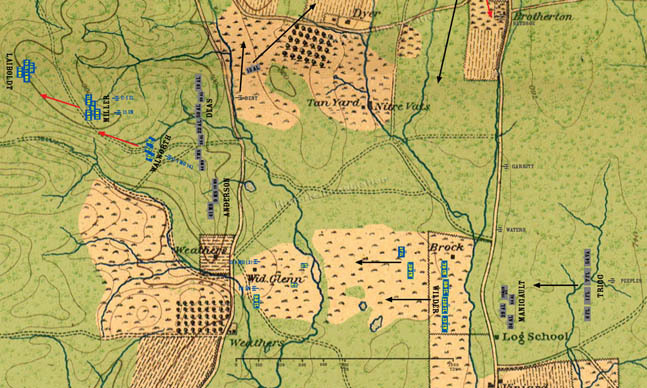 Deas and Anderson pursue Sheridan’s division to the first ridge west of the Dry Valley Road, and then halt to reform. Dent's Artillery is sent north in response to a request from General Johnson. The 15th Alabama moves north on its own again trying to find Perry's brigade. Wilder’s brigade and the 39th Indiana pursue Manigault to the Lafayette Road. However, Trigg’s Brigade from Preson’s Division is ordered forward to support Manigault. Wilder halts his pursuit on encountering Trigg, and falls back to the Widow Glenn cabin.